Up to 600 Euro compensation!! If you booked a specific flight, were present in time at the check-in-counter to be processed, but your airline canceled your flight and/or the flight delayed for more than three hours, you´re facing significant inconveniences. You not only are stuck at the airport, but you also may not arrive in time for an important business meeting or a family reunion or your vacation can not start in time to say the least.The EU Regulation on Air Passenger Rights (No. 261/2004) provides a lump sum compensation in these cases, which your airline has to pay you as liquidated damages. In our experience airlines still attend the aforementioned duty hesitantly. Without legal action, it is almost impossible to enforce such claims against airlines. We help you to claim your right in court and can assist you regardless of where you live - in case of success completly free of charge! 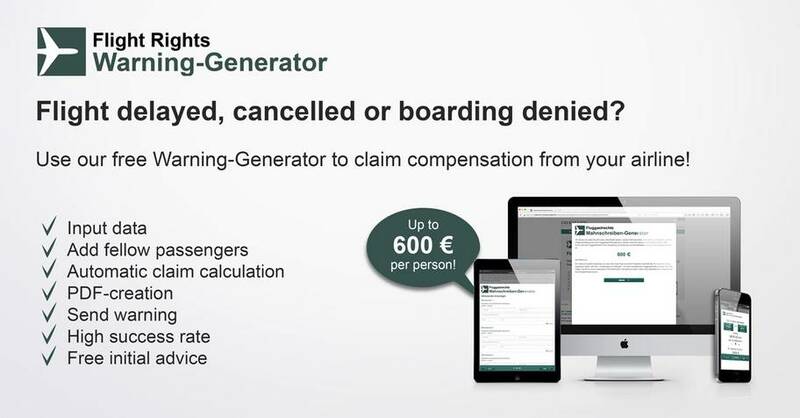 Claim up to 600 Euro compensation from your airline with our free Warning Generator! In case of a flight delay of more than three hours, a flight cancellation or denied boarding the EU Regulation on air passenger rights (No. 261/2004) provides a lump sum compensation as liquidated damages up to 600 € per passenger depending on the distance between your departure and destination airport. Unfortunately airlines tend to pay compensation very hesitantly. In fact, without taking legal action most airlines are not willing to pay compensation at all. Therefore in most cases filing a lawsuit is inevitable. Before filing a lawsuit the affected passenger should set the airlinie a deadline to pay the compensation though. Otherwise the passenger would have to bear the costs of the lawsuit, if the airline chooses to admit the claim right away. With the help of our free Warning-Generator, you can generate a warning and prompt the airline to pay. And with a little luck the airline will pay in reaction to this letter with no further legal proceedings required. Use our free Warning-Generator to generate a warning now! For your convenience, we´ve provided a free Warning-Generator, which helps you to generate a warning letter to claim compensation from any airline in case of flight delay, canellation and denied boarding. If you have any questions regarding the Warning-Generator, please feel free to contact us anytime. If you have already addressed the airline in writing and asked that it make a payment by a certain deadline, further requests on your part are not required. Our free Warning-Generator is recommended by the famous German Newspaper BILD (in the edition of 22 july 2015). Your Airline refuses to pay? - We take legal action for you! If successful, completely free of charge! If your airline doesn´t pay you the claimed compensation upon written request within the set deadline, you would need to take legal action. We claim your compensation in court. If successful, completely free of charge! Consult us free of charge regarding the chances of success of a lawsuit against your airline! To assist you in finding the address of your airline, we´ve created a list of airlines departing from Europe in MS-Excel-format (last updated: January 15th 2015). Please note, that we cannot take any responsibility for the accuracy and currency of the provided information though. The list is copyright protected and must not be published, copied and/or distributed without our prior written permission. In case you notice data provided in this list being no longer up to date, we would very much appreciate a corresponding notice.